How do you differentiate, when making evaluative judgments, between a musician producing strong work in a specific lineage, and a musician being merely derivative? How do you define, and privilege, innovation over the extension of a tradition? How, for example, is pianist John Tilbury deemed brilliant, even while nearly every critical response to his work contains the apt signifier Feldmanesque, while many other improvisers are regarded less kindly for their decision to essentially continue working through a self-limiting area of sound? 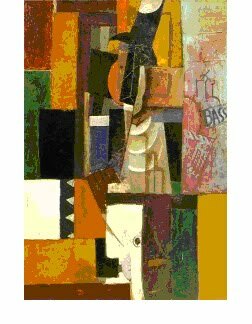 The century-old squabble, to place this question in the context of visual art, over whether Georges Braque or Picasso authored the Cubist revolution came to mind, as I researched the guitarist John Russell and found, again and again, guitarist Derek Bailey in nearly every entry. 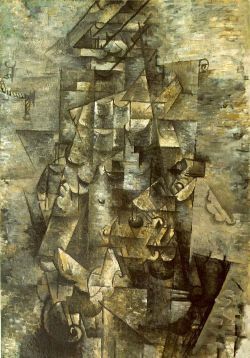 I am far from an art historian, but I think one thing is clear- Braque was well underway in improvising against the hold Cezanne and other antecedents had on his approach to painting, when he met Picasso. That encounter served as equal parts apprenticeship, catalyst and, eventually, co-creation of new possibilities. As Braque moved beyond the orbit of Picasso, he came to this idea- the painting is finished, Braque said, when the idea has disappeared. At some point in any apprenticeship, the student may develop beyond the original idea and conceptual approach of his teacher. His work is his work, when the idea disappears. 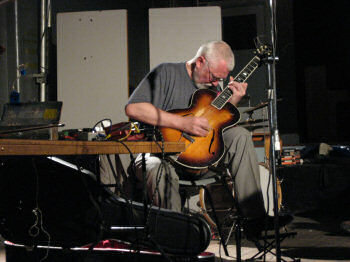 London-based guitarist John Russell has performed, organized festivals, and articulated his ideas about free improvisation for 40 years. He is well represented by a discography that includes some celebrated releases; for many, the most recent gem is the reissue of the sole available recording of the ensemble News From The Shed. This 1989 quintet date is now regarded as a seminal work in the transition for several of its members from the discursive, dialogical and, as one of its participants [trombonist Radu Malfatti] has it, on-and-on-going gabbiness of much free improvisation, to something new- a branch of improvisation that jettisons gabbiness, dialogue and high speed reactions, for a reassessment of the uses of elements like silence, erasure of foreground/background, and a heightened sense of attunement, to reference Malfatti again, to the lull in the storm. I focus on this particular project, out of all those Russell had been involved with in the nearly two decades preceding News From The Shed, for a reason. While three of his fellows from the quintet- Malfatti, Phil Durrant, and John Butcher- would gradually move further into the radically quieter, less virtuosic and uncluttered area of improvisation called, variously, reductionist, lower-case and EAI, Russell would continue to hone and meliorate the basic elements heard across the decades in his approach- empathic, dialogical, interactive free improvisation; yes, often garrulous, using high-speed reactions and by now familiar extended techniques to draw forth any and every sound from his acoustic guitars. The collective sound of that ensemble was a fulcrum for some to leap into a new field, and for Russell to continue plumbing the more familiar ground established many years earlier in his association with guitarist Derek Bailey. I am reactive, Bailey stated more than once, and Russell’s plumb-line, extending a true vertical of free improvisation, is reactive as well. As I said earlier, I did some surveying of the writing about Russell on the internet; culled from reviews of records and live performances, whether enthusiastic or indifferent, the shadow of Bailey falls across nearly everything I read. 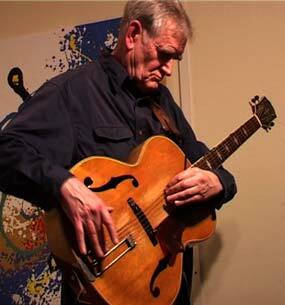 In the years since Russell left his former teacher’s orbit, whom he received lessons from in the early 70’s, he has developed the germinal Bailey approaches-plectrum scrapes and string rasps, above-the-nut plinks, rapid successions of alternating harmonics, percussive chord attacks, and dense, dark harmonies. Anyone, whether intimate or merely acquainted with Bailey’s guitar sound, can identify the elements in Russell’s approach. Russell has not remained, however, in that orbit. His approach to the guitar, exclusively acoustic since 1977, engages areas of sound possibilities with greater patience, lingers longer to develop a sound, permits much more silence, clarifies notes and tones through fragmentation and splintering; he reduces and settles, as much as he agitates and roils. In a way I do not believe we ever play music, but are sometimes lucky to get close to it, Russell once stated in an interview, and personally I find that free improvisation specific to a time and place is the best way to do this. 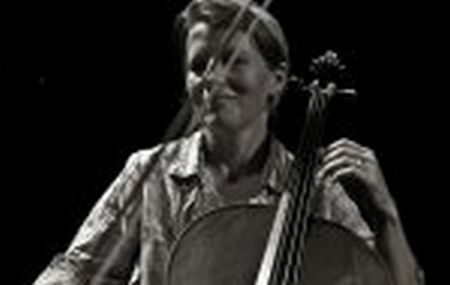 Russell gets close to the music in his duet with cellist Martine Altenburger, titled Duet, released in 2010 on Another Timbre. Duet is a live performance from a 2008 festival in France, edited into five tracks. The sound is excellent, warm and intimate. Wood and wire are heard with clarity, and the silences and rests sound equally live. Cellist Altenburger is a new name to me, and most certainly to most of you as well. She is conservatory trained, but leaped into a pool of improvisers around 1989 that included Michel Doneda and Le Quan Ninh. Her name appears on only a few releases, despite Ms. Altenburger’s consistent involvement with performance events for over 20 years. She moves between performances of Cage and Scelsi, and dates like Duet, in which she scrabbles and sings on the cello, engaging Russell confidently and, at times, mimetically. She pulls a wide range of sounds from the cello, pizzicatto as well as her rich, singing bow work. I do not hear either musician employ extended techniques irrelevantly, or in a show-boating fashion. Rather, Duet is another specific time and place for Russell and Altenburger to push out beyond the received ideas, into conference, engagement, and occasionally, bracing and beautiful confluence. The price of the ticket is met, for me, in the concluding several minutes of track 4, as the duo entwine Altenburger’s keening, melancholy cello line, with Russell’s odd, strummed folk chords, repeated just long enough to invoke an ancient song. Duet isn’t for anyone insistent on hearing a new innovation in every release; it is for ears that value, as Milo Fine titled his 1977 release, the constant extension of inescapable tradition. Radu Malfatti quotes from his Paris Transtlantic interview in February, 2001. This entry was posted in music writing on June 20, 2010 by jessewgoin. Thanks, Richard, I am grateful you visit crow.